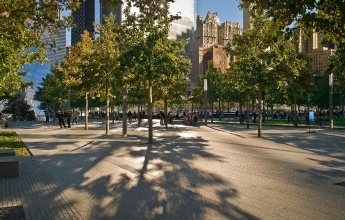 As part of the effort to create a memorial to the victims of 9/11, PC+A was retained in 2005 by PWP Landscape Architecture of Berkeley, California to assist in developing and implementing tree-related aspects of the project. 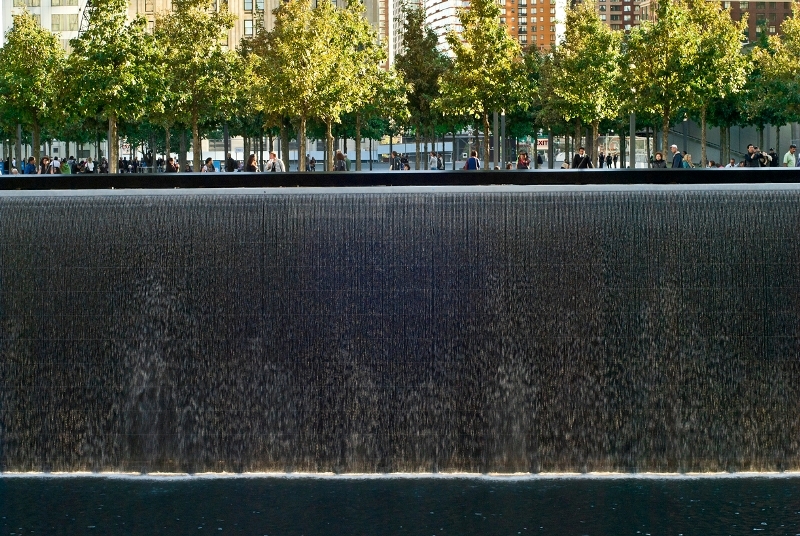 The art that architect Michael Arad and landscape architect Peter Walker crafted on an 8-acre canvas was designed to be a visible expression of absence - to forever represent the overwhelming emptiness that the tragedies in New York, Washington D.C., and Pennsylvania left in so many. 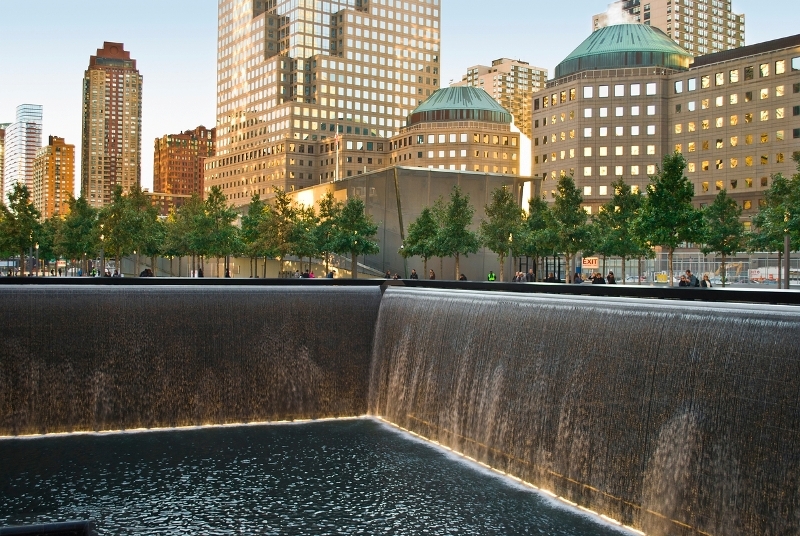 At the same time, the design elegantly resolved several contrasting, and seemingly incompatible objectives: The Memorial had to be powerful and evoke emotion, yet be comforting and soothing. 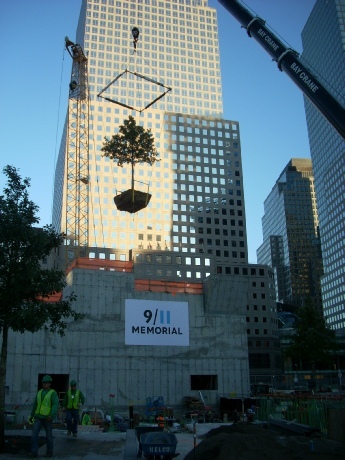 It had to memorialize the devastating loss, while celebrating rebirth and life. 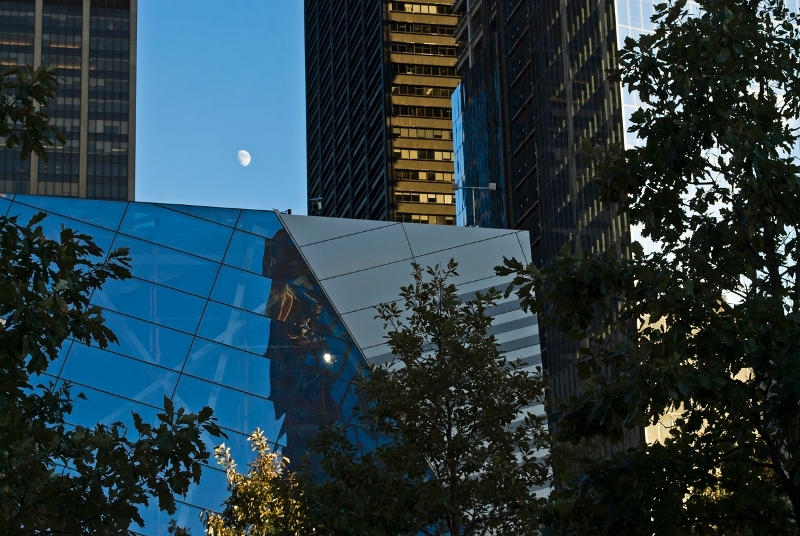 It had to be a place where family members, local residents and the world would be drawn to mourn, while serving as a high-use public space for a city picking itself up and moving forward. Key to Arad and Walker's solution was surrounding the massive pools with a modern, simple and understated park consisting of an apparently endless flat plane and a limited number of landscape elements that each contribute meaningfully to the design objectives, but without drawing attention to themselves. 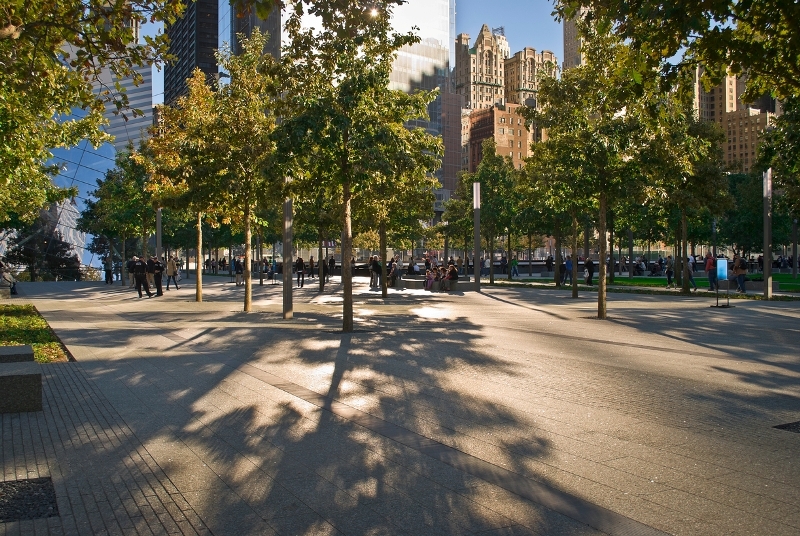 Originally imagined as a stark, open plaza, PWP's addition of a forest of 420 oak trees helped humanize the Memorial with emerging new life, comforting scale, and moderation of intense sun, wind and city noise, along with several subtle artistic plays. 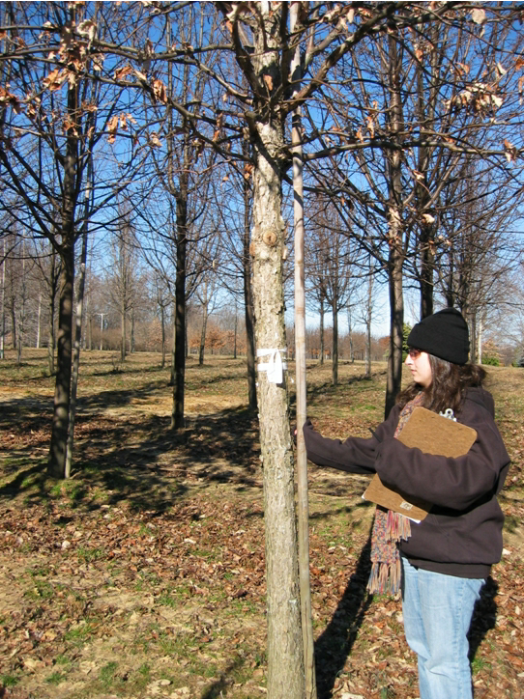 The mandate that these 420 trees contribute meaningfully without drawing attention to themselves demanded a single-species collection of trees, closely matched in size and form, that would form a closed canopy and reveal perfectly straight trunks as they grew and were limbed up over time. 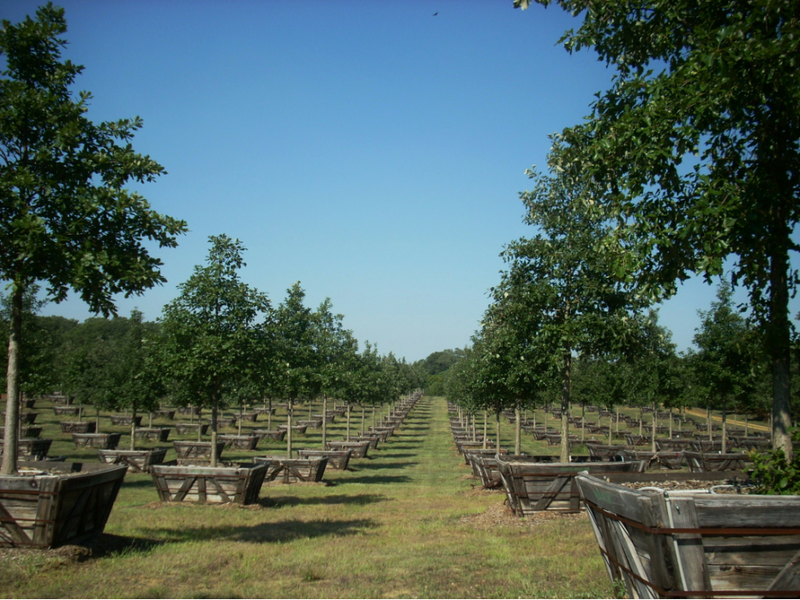 Oak was the obvious choice, given its stature, longevity and symbolic strength. 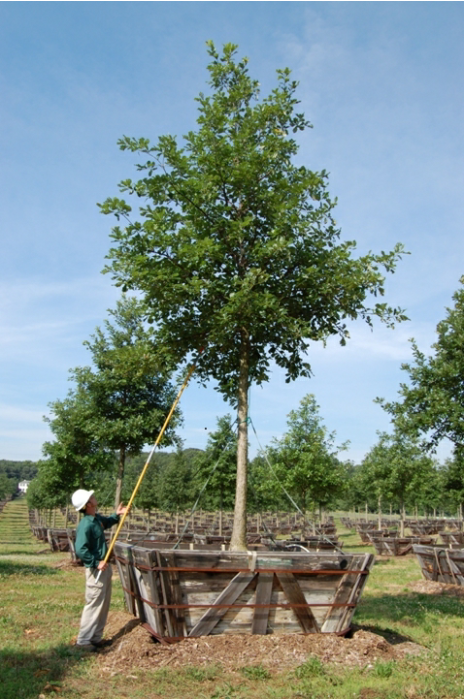 After vetting many potentially suitable species, PC+A presented a shortlist of recommendations and the designers settled on swamp white oak (Quercus bicolor). 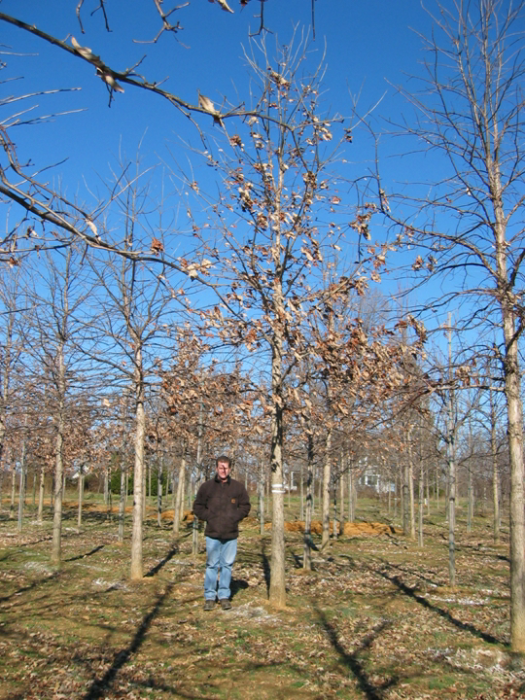 In addition to meeting the design objectives, swamp white oak is widely considered to be less prone to serious insect and disease problems in monoculture than many other species and is strong-wooded and very tolerant of urban conditions. 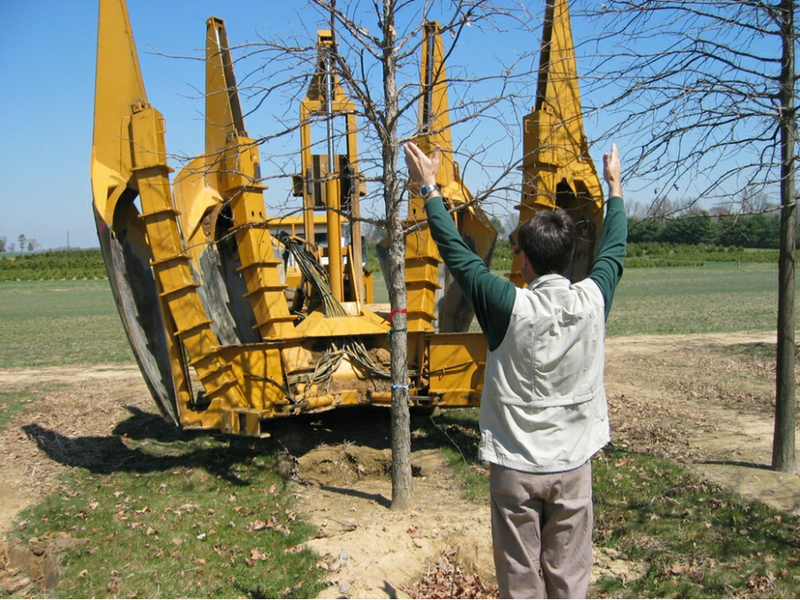 Working with PWP and Environmental Design, PC+A field evaluated and graded thousands of trees at dozens of nurseries and in natural stands in five states against an exacting specification before making final selection of the exceptional quality trees that would grace the Memorial. 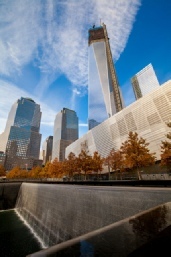 The World Trade Center redevelopment has frequently been described as one of the most complicated construction sites in the world. 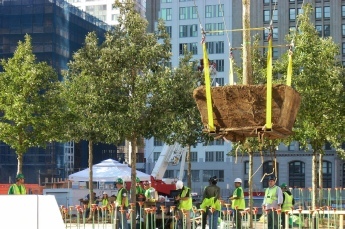 With numerous fast-tracked heavy construction projects simultaneously underway above, below, and on all sides of the Memorial, tree planting had to fit precisely within a boggling matrix of process and deadlines. 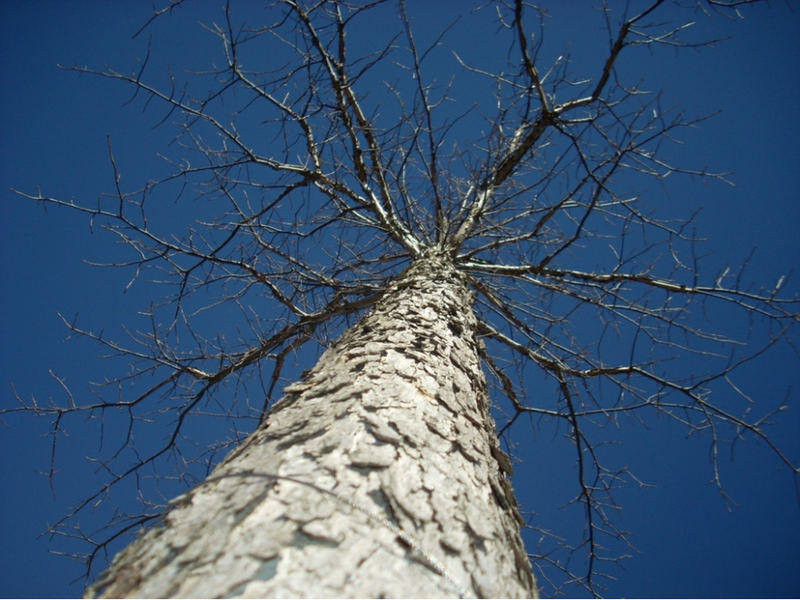 On top of that, absolute zero transplant mortality and post-planting stagnation were mandated. 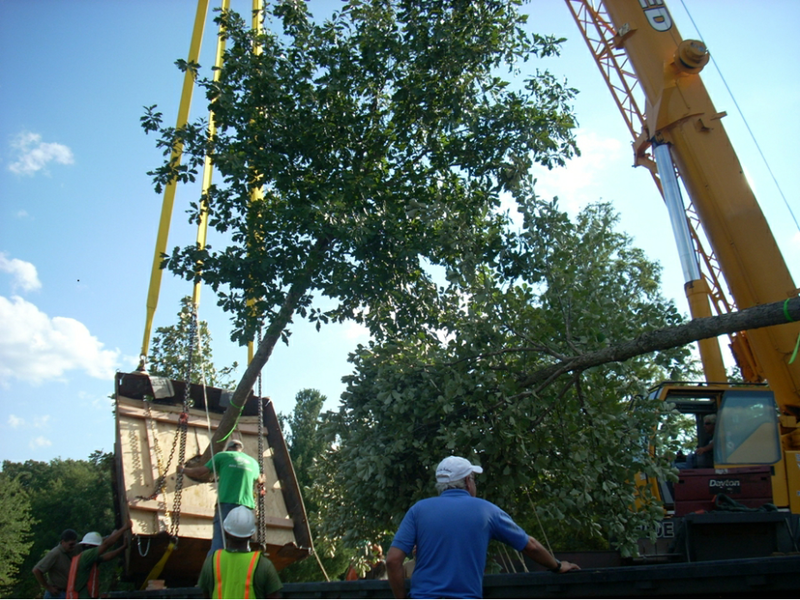 To accomplish this, PC+A and PWP developed an elaborate, non-traditional program for pre-harvesting and preparing the trees, as well as a specification that was strong and thorough, yet nimble enough to adapt to an evolving design and ever-changing schedule. 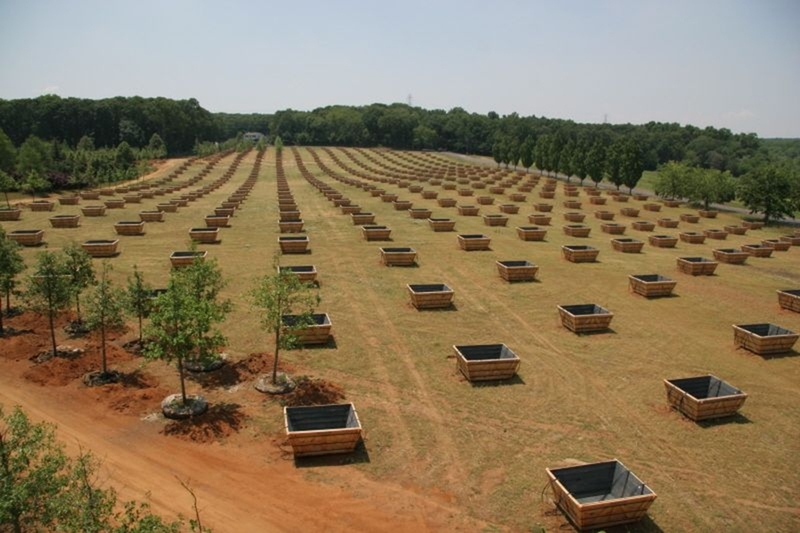 All trees were dug with oversized root balls and planted into large boxes set up in a temporary nursery in New Jersey. Here, they were primped and preened for four years with the objectives of optimizing structural and aesthetic form, maximizing health and vigor, and matching crown height and silhouette. 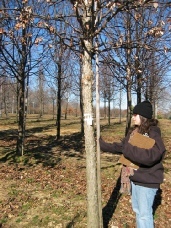 Several strategies were employed to manipulate the growth rate of individual trees to improve consistency in their size. 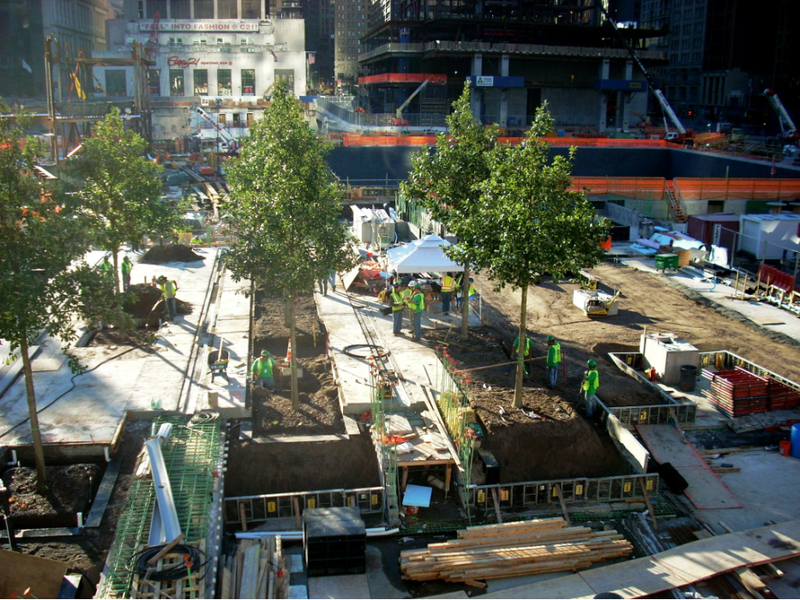 In this manner, all trees had fully recovered from transplanting before they were moved to the Memorial, they were acclimated to local conditions, seasonal restrictions on planting were eliminated, and well-knitted and identically dimensioned root balls allowed for rapid planting through narrow openings in the plaza paving. 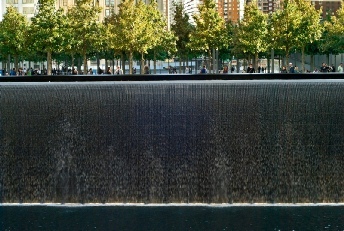 The Memorial is so simple in its powerful statement, yet incredibly complex in its implementation. 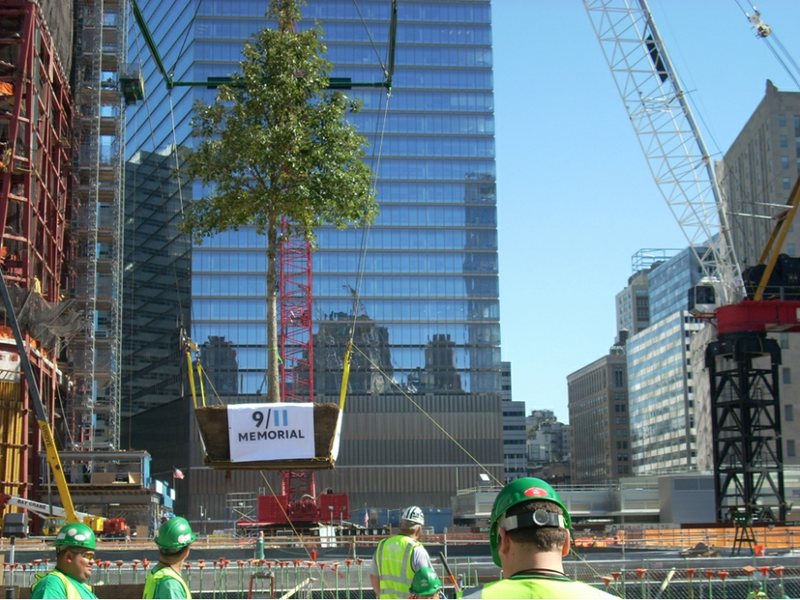 As an 8-acre, street-level green roof sitting atop the 9/11 Memorial Museum, PATH train station, subway tracks, parking garages, and a maze of massive utility systems and other structures that occupy 7-stories below, design of the plaza tree planting posed many complex challenges. 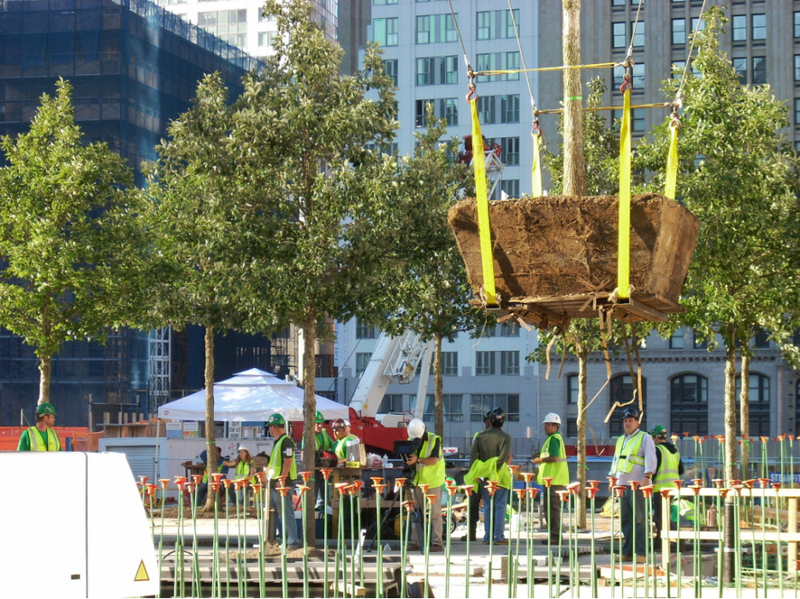 PC+A's tasks included contributing to PWP's design of an elaborate sub-plaza planter system containing large volumes of sustainable soil, irrigation, drainage, and continuous soil aeration that will allow the trees to grow for many years and reach considerable size. 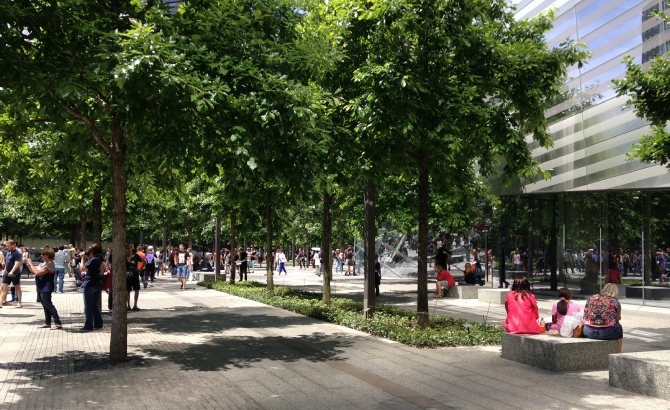 Maintenance corridors between the planters permit routine maintenance and adjustment of the tree growth systems. 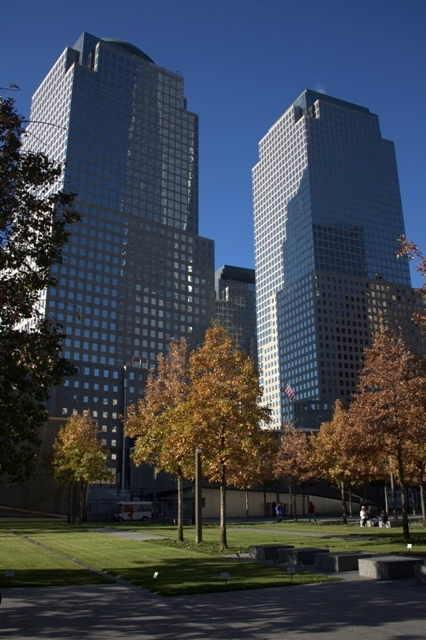 To help meet the requirements for LEED Gold certification from the U.S. Green Building Council, trees were harvested from within a 500-mile radius, including the states where the 9/11 attacks took place, a resistant species was selected to minimize pesticide usage, and 40,000 tons of soil was carefully selected and blended to eliminate phosphorus fertilizer needs while satisfying stringent engineering requirements. 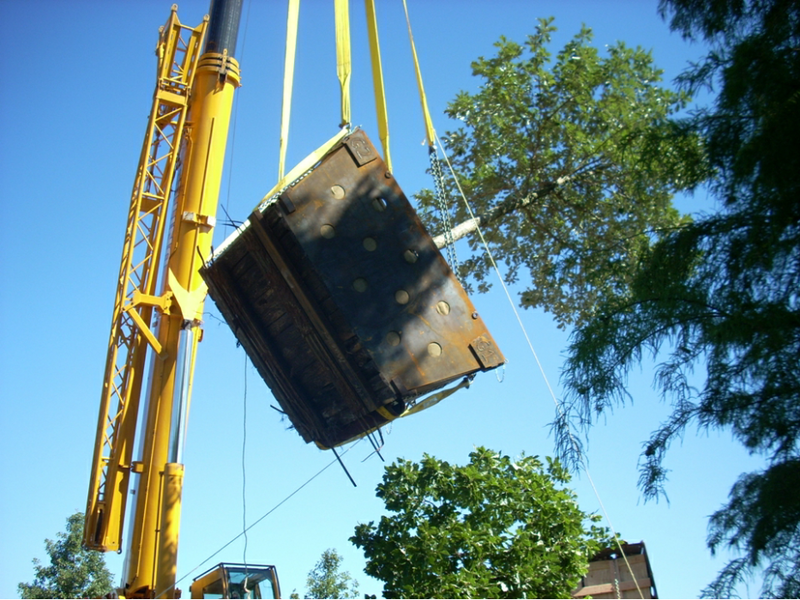 All rain and snow melt is captured, stored, and recycled as irrigation for the trees and groundcovers. 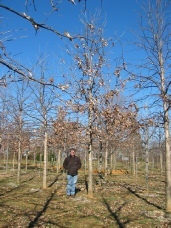 For a detailed animation of the tree support systems, please see the New York Times. 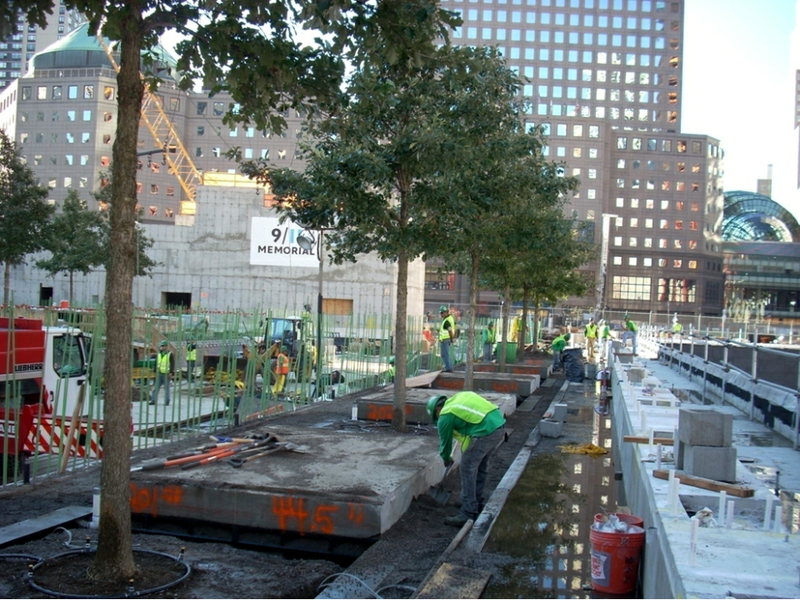 After rigorous ongoing review by PC+A for health and vigor and by PWP Landscape Architecture for aesthetic form, trees were culled and delivery of the best to the Memorial site began in August, 2010. 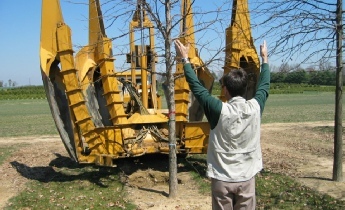 Once procedures for loading, transport and planting at the Memorial site were established, subsequent planting and maintenance continued in the capable hands of Environmental Design and Bartlett Tree Experts. 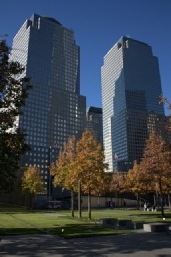 The Memorial opened on September 11, 2011 with approximately half of 437 trees planted. Over 8 million people from around the world have visited in less than two years since. 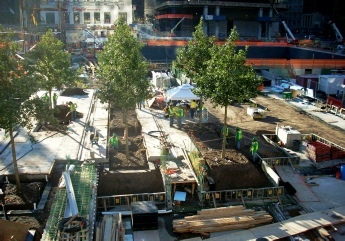 The remaining trees will be planted in phases as construction at the World Trade Center complex progresses and designated tree planting sites become available.